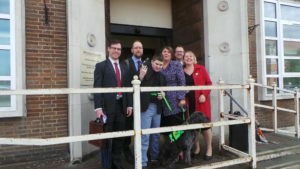 Jimmy McCafferty, an 11-year-old child who has an autistic spectrum disorder, has won £22,000 in damages and legal costs at Bow County Court against shopkeeper Dudu Miah. Jimmy was represented by David Renton of Garden Court’s Employment and Discrimination Team and Rheian Davies of DH Law Ltd.
Mr Miah had refused to allow Jimmy to top up his oyster card and had shouted at him and his mother as he threw them out of the shop. Mr Miah claimed that his shop had a ‘no dogs’ policy and would not make an allowance for Jimmy, who had an assistance dog with him. Jimmy uses ‘Kizzy’, his trained assist dog, to maintain his safety whilst he is out and about. Part of Jimmy’s condition means that he is sensitive to noise. Occasionally, he bolts, putting him in particular danger when he is near busy roads. Jimmy is tied to Kizzy via a special harness and if he starts to run, the dog sits down hard and stops him running away. Media enquiries should be directed to Rheian Davies on 020 8840 8008. Katy McCafferty is available for further interview in person, with Jimmy, in East London until Saturday 1st October 2016. After that she is available by phone.